©Paul McCambridge – MAC Visual Media – 2016 Glanmore Lake, Beara Peninsula, Co Kerry. Slip into tranquil waters around this tree-shaded lake to swim through reflections of the towering Caha Mountains. Weave around the many rock islands in this pristine lake each with trees growing in impossibly little soil. Even climb out and explore the man-made crannog with its small and over-grown stone building. On a calm day the lake waters act like a mirror, broken only by the occasional trout jumping, spreading ripples out across the surface. Walking into the lake you realise it is alive with tiny insects flitting above the surface, it is these the trout are leaping for and the birds which swoop low over the water returning to the heights of the trees to eat their fill before their next flight. Well-known as a fishing lake, Glanmore is one of the nicest lake swims on the Beara peninsula, set at the base of Lackabane Mountain with the trees reaching up to the sky it could be deep in the Canadian wilderness. Getting there; from Kenmare Co Kerry, cross over the Kenmare River and turn right onto R571(this junction has an astounding 20 signs so don’t even try to read them!) Enjoy the scenery as you wind along the river 24km to Lauragh. From Lauragh take the R574 Healy Pass road, past an old pub, an Sibin, turn left following signs for Rosie’s Lake view Restaurant. Climbing further into the mountains as you pass the entrance to Rosie’s the road drops and you get your first view of the lake, pick your spot along the lake shore. From the car park at Tollymore Forest follow the River Trail under the impressive stone arch and follow the stream as it chatters on its way down to meet the Shimna. The first of many pools sits just below a small waterfall and bridge, pleasant for swimming with broad flat rocks on the edge. Continue walking upstream and in a matter of minutes you come to the Hermitage, perched on the edge of the rocks, this whimsical folly leads you through tiny medieval style buildings. 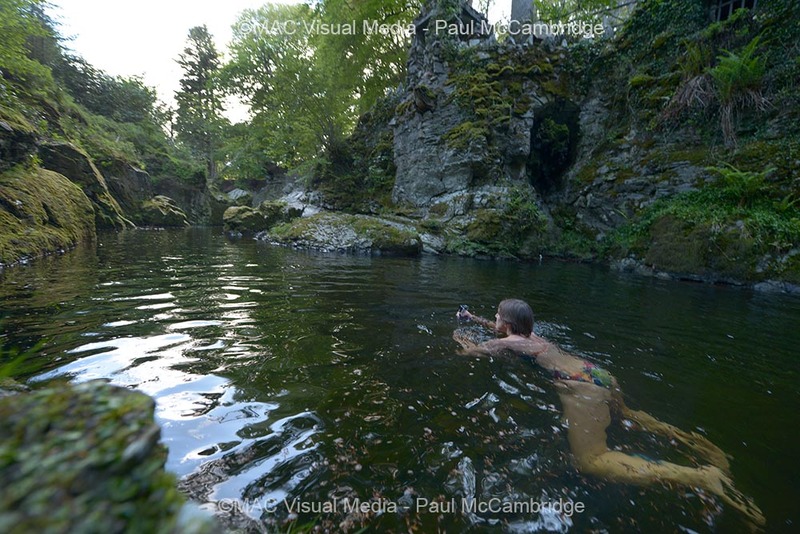 The open windows look down into the miniature gorge beneath and a deep pool that curves around the rocks. Follow the path through each room to a low, castellated wall, step over and climb down the rocks to the pool. Allow your imagination to run wild as you swim downstream, under the turrets of the Hermitage, looking out for trolls or other dangerous creatures hiding in the crevasses! 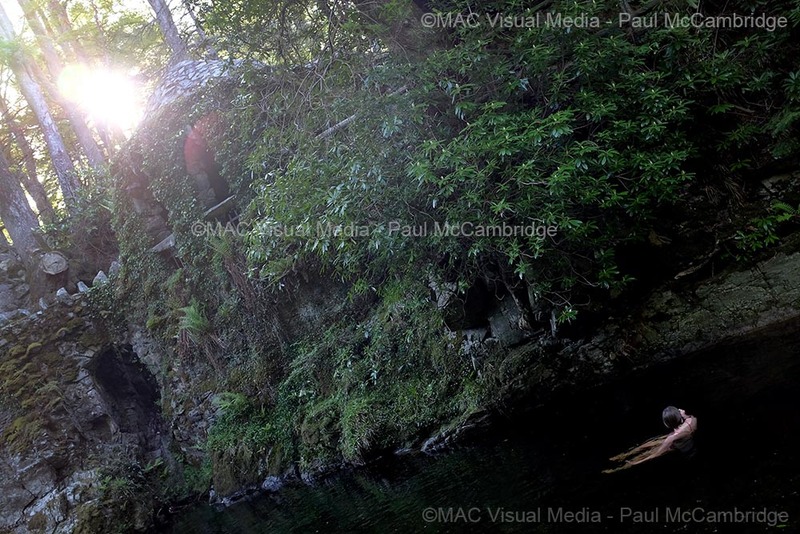 Returning upstream, the light, dapples as it breaks its way through the trees to play on the waters’ surface. As you approach the top of the pool the flow of the water increases as it spills from the river above, forced into a narrow channel. With the thrill of fast moving water bubbling past your ears, swim hard towards the fall into the melee of churning water, a natural jacuzzi, then relax and let the force sweep you back to the calm of the wide pool. The little row of charming buildings tends to bring out the child in each of us, the urge to duck through the low doorways and play games of knights and castles. 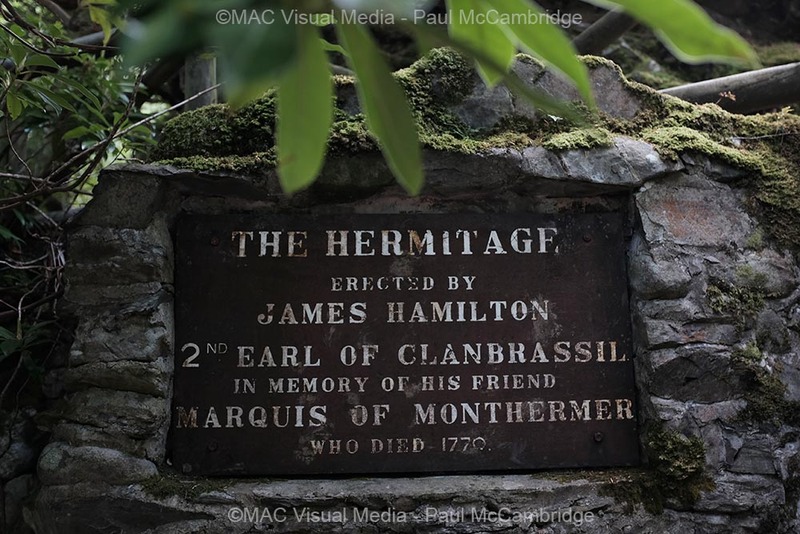 They never fail to bring a smile to my face and it’s lovely to think of the thousands who have sheltered from the rain in them since they were built in the 1770s by James Hamilton, 2nd Earl of Clanbrassil, in memory of the Marquis of Monthermer. In those days gone by the ladies would shelter inside while the gentlemen fished for salmon in the Shimna below. Children will love exploring the path and buildings and for a longer walk continue on up the river where there are many more pools to explore. A full day can be spent happily walking the many paths of this superb park.